Monday's Mood Board - How To Style A Tray! Today's Monday Mood Board is "All In The Details". This week I'll be talking about ideas on how to style a tray. I'm freshening up my own interiors this year, starting with my Living Room. (More on that soon!) If you have no need to remodel your living space but want to change it up a little bit, here's a quick and easy way to brighten up your space. Simply change the decor on top of your coffee table. Even though I have a separate studio space in my home, I spend a lot of time working on my lap top in my Living Room. Being a very visual person, my environment is very important to me. A vase of fresh flowers, a delicious smelling candle, books that inspire...these are all things I surround myself with because they make me happy. I have a glass top coffee table. To make sure it doesn't get scratched I like to use trays. I have tons of them. I'm kind of obsessed with trays! I recently met @OohLaLaFinds via Instagram and fell in love with all their designer inspired trays! 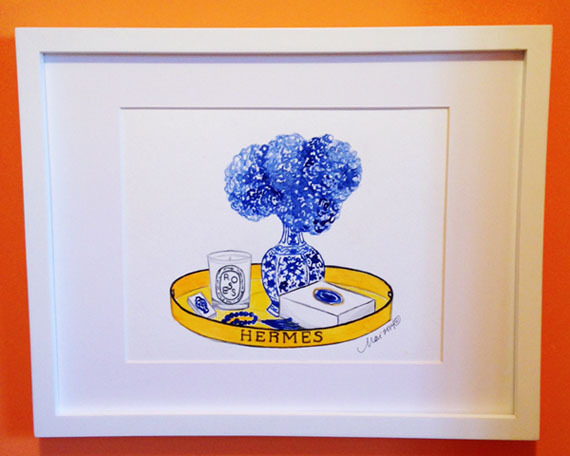 This Hermes inspired tray is divine! 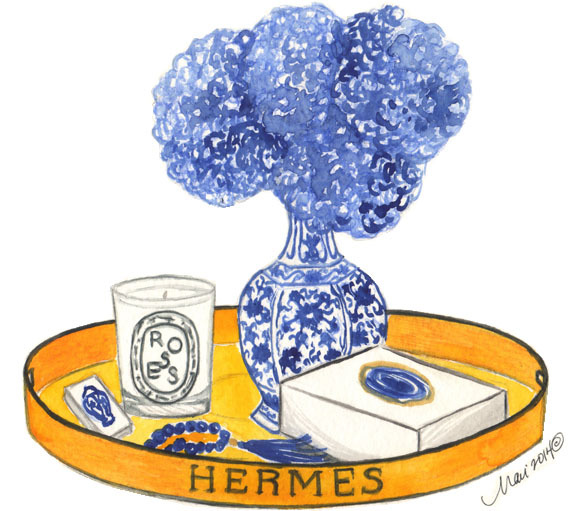 If you want a real Hermes, (I don't believe Hermes makes this actual tray any more), you may have to look at auction houses. A great smelling candle. One can't go wrong with Diptyque Candles. With a great smelling candle you will need matches. Place wooded ones in a small jar or purchase ones like these from Design Darling where the packaging is simply adorable! A gorgeous vase of fresh flowers like this one by Bungalow 5. Small decorative boxes to store items like reading glasses or pens. This one is almost too pretty for that with the stunning agate stone on top! Not included but just as important, are books! Books tell people who you are and what you are interested in. I love seeing what books people surround themselves with! One side note: I'm pretty smitten with how this little painting came out and decided to offer it for sale in my shop if you're interested! Happy Styling! Check back later this week for more thoughts on Styling A Tray! For all the men and women who have dedicated theirs lives and given so much to our county...THANK YOU!!! Monday's Mood Board - Spice Up Your Entry! A great entry way immediately sets off what the experience is going to be like in your home. If you have the space for it, I love a good console table. It's such a fun accent piece that you can change with a few decorations each season. This incredible one came from CircaWho. The elephant accents on the legs are what did it for me. Her shop looks like a designers dream! Good thing I'm all the way on the West Coast or I could see myself doing some serious shopping there! The lamps on my Monday's Mood Board came from there too. Such a fun web site to browse through as well. The Pagoda Mirror (to die for) is from the lovely ladies over at Zinc Door. I am loving Navy lately! But as much as I love Navy, I'm personally not the monochromatic type...Give me Color! These Green Linen Ottomans from Shop Ten25 are the perfect accent. Navy, Green, Coral....Oh My! You can find these fantastic ottomans here! They come in other colors as well. Fall is coming...now is the time to take a chance and spice up your entry with some unique pieces that have interest and character, add in some delicious color and you will smile every time you walk by your fabulous entry! Monday's Mood Board - Snuggle Up! Today's Monday Mood Board is all about a cozy place to snuggle up and read a good book. Most of my clients will tell you that I am not a fan of hallways. I try to avoid the long bowling alley effect as much as possible but sometimes due to the shape of the land and the positioning of the house, it can't be avoided. But there are always solutions to charming up that hallway. 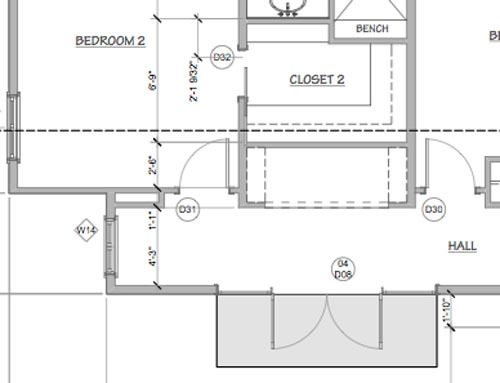 When designing my clients house, I had suggested putting in a window seat but my client took it one step further by creating a deeper reading nook area. I loved it! It's deep enough now that you can actually put a twin mattress on it. Pa-lease! This is where I would want to spend all my time!!! In California we design a lot of Spanish style homes. Largely influenced by the beautiful and historic Missions that line our coast. The architecture makes you envision warm earth colors mixed with cool ocean blues. So today I am sharing with you some of my favorite finds for both! Although I didn't find this gorgeous mirror until after I had painted my Mood Board, I included it as a beautiful alternative to the art on the back wall. Just stunning in sapphire and gold by Bunny Williams available at Zinc Door. I love, love, love this Flame Stitch Rug from Shop Ten25. Talk about adding a little pizzaz to your hallway! For the fabrics I picked a few from Fabricut and Highland Court. They are a nice compliment to this decorative throw pillow from ETSY. Monday's Mood Board...My Summer Wish List! Summer time is here and this week I'm touching base on my Summer Wish list. First on my list is a really cool beach cruiser. As the crow flies, we only live about 2 miles from some of the most incredible California beaches. We have beautiful bike trails here but I have been in need of a new bike. When I came across Lilly Pulitzer's Beach Cruiser, I fell in Love! I have been a fan of Lilly Pulitzer for many, many years. I have always loved her bold and graphic prints. This bike is just too cute in her Pink Chum Print! You can see it here. Check back later this week for more of my summer must haves! Monday's Mood Board Is Squeaky Clean! Happy Monday everyone! I took a little break to work on an exciting project with a fantastic on-line shop, Shop Ten 25! Soon we'll be revealing all the fun details about that project. For now I'm back in my studio (finally) and it's time for another Monday Mood Board! Today's MMB is inspired by the bathrooms I've been working on lately along with some terrific bath accessories from some of my favorite on-line shops! First up are these Nesting Jars from Restoration Hardware. What girl doesn't need more storage? Cotton balls, bath salts, you're all set. Maybe it's the sunny weather but I'm loving these Polka Dot Bath Towels from Garnet Hill. They just make me smile. Something else that makes me smile is this gorgeous Flora Mirror (that doubles as a piece of art - don't you think?) from Shop Ten 25. Also from Shop Ten 25 is this Faux Crocodile Skin Waste Basket. If anyone can make a Waste Basket look divine, it would be them! And who wouldn't love a cushy, white Polka Dot Rug from Layla Grayce? So fabulous! Last but not least, one can never have enough make-up bags. 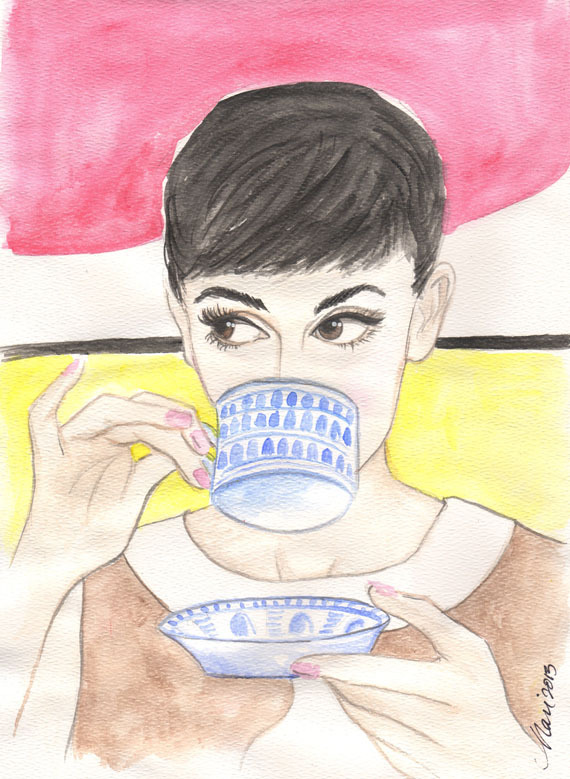 This one is by my friend, Lindsey, over at The Pleated Poppy. All her product are original and fresh. Love, love, love them! So what's up with the ballet shoes? Some of you may know that I've been a dancer and a dance teacher for more years than I'll ever post (Eeeek!) and lately I've been messing around with painting dancers...and dance stuff... so I thought, what the heck? I'll throw in a little painting within a painting, just for fun! Monday's Mood Board Is Getting All Dressed Up! Every once in a while I get asked to design something really fun and unique. This time it’s a little clothing boutique that just needed a breath of color. My inspiration piece is this gorgeous chair I found during one of my addictive Pinterest afternoons. As you can see I’m continuing with my Rose theme…It’s what is inspiring me right now along with "That Chair" (pitter-pat goes my heart) that was featured on Lisa Mende’s Design blog. I’m in love with the large textile and the stripes on the armrests. It became my muse! In keeping with the black, pink and gold theme, I found this wallpaper, soooooo pretty! I’m going to use it on the bottom of the wall and add a black piece of trim to cap it off at chair rail height. I’m also going to use it just on the back of each dressing room wall. Down the hall across from the rooms I’m also going to add some artwork and these round mirrors I found at IKEA for only $14 but to make them more interesting I’d like to paint a gold and black design behind them. I’m also going to paint a frame around the large mirrors they already have in the dressing rooms. This is a much less expensive solution than framing the mirrors with wood. I still have more things to ad-dress ha ha in this space, such as lighting and artwork so stay tune for more updates on this fun project!